In this study, we looked at the largest electric and natural gas utility serving each of the 51 largest metropolitan statistical areas (MSAs). 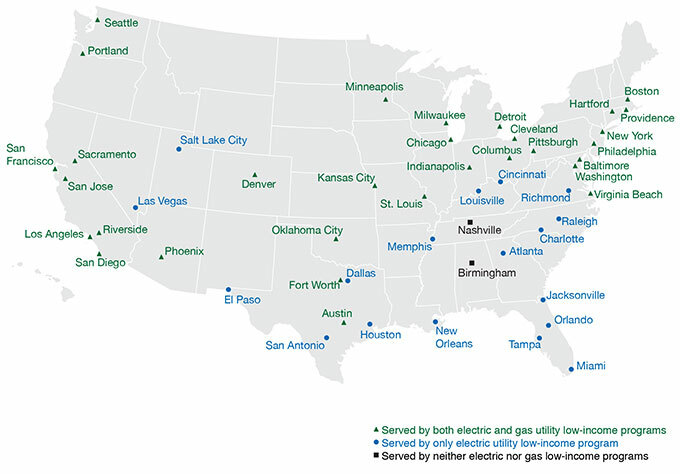 Overall, we found that nearly all MSAs in the country were served by either an electric or electric and natural gas low-income utility program, with 61% of the cities served by both an electric and natural gas low-income program, as seen in the map below. Note: these programs are in addition to those funded through the federal Weatherization Assistance Program (WAP). Low-income programs varied in terms of how deeply they address whole-home energy efficiency needs and how accessible they were to customers. Although numerous utilities incorporate best practice elements of program design—such as including appliance upgrades and health and safety measures—many can include more of these elements. We also looked at best practices in implementation, including whether programs target specific households based on energy burden or other vulnerabilities, streamline enrollment for easier access, and partner with WAP to leverage funds and reach more customers. This study found that while many utilities design and administer impressive, effective low-income programs, many programs could be improved with best practice elements or increased resources. For example, utilities can use the data to see how their programs compare to those of similar utilities and to identify opportunities for adding best practice elements. State and local policymakers as well as other stakeholders can use the data to compare their local utility programs to programs nationally, and they can identify program elements to either include or improve in future program design and implementation. We also added this new dataset to our ACEEE policy database, which for the first time contains information on low-income programs from our baseline assessment. The database includes new state-level information on low-income program requirements, cost-effectiveness rules, and coordination with the WAP program. If you have questions about our new research or would like more information or access to the data cited, please contact Ariel Drehobl at adrehobl@aceee.org.